Bilva (Aegle marmelos) leaf is an embodiment of Lord Shiva and hence Bilva tree is considered extremely sacred in Hinduism. The tradition of using Bilva leaves in Shiva puja is prevalent all across India. The spiritual significance of Bilva permeates the Hindu religious customs. It is said that by worshiping Lord Shiva and his consort Parvati with sacred Bilva leaves, a person is endowed with divine bliss. In Hindu pantheistic studies, Bilva is the symbolic representation of many Hindu gods and goddesses including Shiva, Parvati, Surya and Lakshmi (goddess of Wealth). But, particularly the Bilva leaf is a favorite of Lord Shiva to the extent that no Shiva Puja is considered complete without offering him Bel patra or Bilva leaf. So deep is the association of Bilva tree with Lord Shiva that he is given the name ‘Vilvadanda’, meaning staff of the bel-wood. 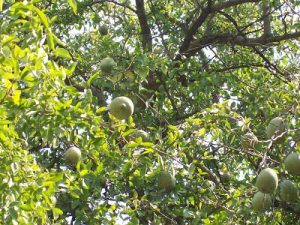 The importance of Bel or Bilva tree is tremendous in Bengali tradition. During Durga Puja, which is the prime festival of West Bengal, goddess Durga is evoked with the twig of Bilva leaf following which the prayer connoting the following phrase is recited. In Hindu religion, breaking or cutting off a Bilva tree branch is considered sinful as Ghost Gods (Brahmodaitya) reside under this tree. 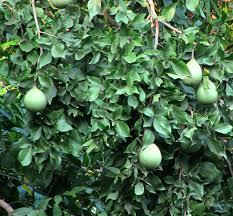 The fruit of the Bilva tree is named ‘Sriphala’, meaning the fruit made out of the milk of goddess Sri (Lakshmi). Bilva branches are especially used in kindling sticks during the puja and this represents the spiritual light ignited from the yonder Sun. Bilva (Aegle marmelos) is generally found in India, Pakistan, and Myanmar. The three forked Bilva leaf is symbolic to three universal gunas – Sattwa, Rajas and Tamas. All different parts of Bilva tree are infused with valuable medicinal properties. The root, leaf, bark, flowers and fruit of the tree are used in curing all types of snakebites. 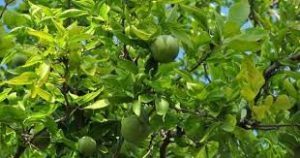 The Bilva or Bael fruit is extremely useful in treating various intestinal ailments. The ancient Ayurvedic system of medicine refers to the usage of its leaves for treating chronic constipation, dyspepsia, and dysentery. In a well-known Ayurvedic tonic named Dasamularisht, Bilva is one of the ten core ingredients. As mentioned in ancient Indian scriptures, those who wear amulet made up of Bilva, their family is immune from every misfortune.